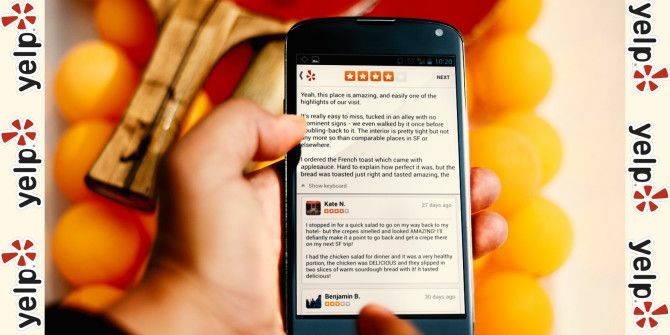 Yelp has finally updated their Android app to allow users to post reviews from their devices, after adding the same feature to iOS last August. Previously, users could only post tips or draft reviews on their mobile devices, but had to wait until they got back to a computer to actually post the review. Tips are staying around for now, but are meant for much shorter notes rather than in-depth reviews. Along with this major update, photos uploaded with a review now appear directly underneath the review, and users can swipe down on the page of any business to see more pictures of the place. The app currently has a 4.4 star rating on Google Play, and reviewers seem elated by the long overdue announcement. For those who think that mobile reviews allow for heated, spontaneous reviews over nothing, Yelp has stated that even on the mobile platform, they still find that 80% of reviews are 3, 4, or 5 stars. Yelp, founded in 2004 as a simple review site, has been facing major competition from other review sources recently such as Google Maps. Last quarter, Yelp boasted 10.4 million unique mobile users per month on average, giving them all the incentive necessary to improve upon their mobile apps. What do you think of Yelp? Is this update enough to sway you, or do you have a different favorite review app? Let us know in the comments. Do any of these allow me to make cards on my PC then transfer them to my phone? I would not want to be typing out all my cuecards with my thumbs and tiny phone keypad. Judges in California and Oregon have stated that Yelp is like the "Mafia" and "Organized Crime". Judge Henry Kantor in Oregon said that Yelp's business model is "offensive". The judge believes that the Oregon Attorney General has an investigation pending regarding Yelp's treatment of businesses and that Yelp's business model is "problematic."